DeckWrap™ PowerBond™ is a self-adhering waterproofing membrane that protects the surface of the wood with a layer of our patented PowerBond™ adhesive system. The asphalt adhesive self-seals around nails, screws, punctures and other fasteners. FOR DECK INSTALLATIONS: DeckWrap™ PowerBond™ should be used as a flashing over the ledger board so that water will not enter the building. Use as a protective barrier to prevent rot, particularly between the decking and the joists. FOR ACQ-TREATED LUMBER: 12” DeckWrap™ PowerBond™ is recommended. ACQ-treated lumber can cause untreated metal components, such as hangers and other brackets, to corrode prematurely. 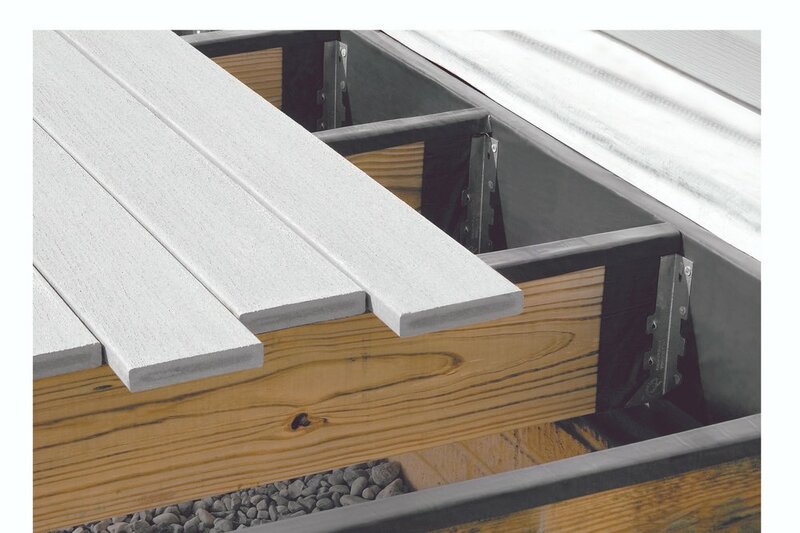 DeckWrap™ PowerBond™ provides a protective barrier between ACQ lumber and metal components. FOR IN-GROUND POSTS: Degradation of the wood is caused by fungal growth when the soil contacts the post. Even in a concrete base, fungi can degrade posts. Rot typically occurs up to six inches below grade. Fungal growth requires oxygen and moisture to thrive. DeckWrap™ PowerBond™ acts as a barrier between the damp soil and the post preventing rot. Use 12” DeckWrap™ PowerBond™ to protect posts. MFM Building Products Corp. (MFM) warrants materials to be free from leaks caused by defects in material or manufacturing for a period of five (5) years from the date of purchase when applied according to published directions. The MFM Seam Roller is an essential tool for securing the side and end laps on MFM self-adhering products.